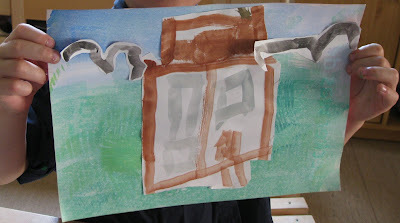 "My house with birds" by E.
Sometimes clients cancel at the last minute. What does one do? Sometimes I am ill and I have to cancel at the last minute too. Sometimes I work for private individuals and when rarely a cancellation occurs we can work out another appointment and I get an hour or so to do some bits-in-between-for-conductors or have a lie-in! If I am working for a centre then it is more complicated. If an individual session is cancelled at the last minute then I get down to some paper work or tidy up. I can on the other hand sign out then do something for myself. Usually I am working with a group so it really is a very rare occasion when the whole group suddenly are not there, but it can happen. The time had come round again for the children from the integrated Kindergarten to have their intensive “Petö” weeks. Instead of spending all their day in the Kindergarten with ten other children, the motor-disordered children have three weeks spending their mornings in a smaller group with me and my colleague. It was time again for the multi-culti Hungarian, English, Greek, Turkish and German group to have some time together. We were surprised to discover at the very last minute that both the Greek and the Turkish departments are already off for the summer in their respective homelands. The Hungarian department said she would leave me, the English department, to do the work in the conductive group, now comprising of only one, the German department, and she would replace the missing staff in the Kindergarten with the other eleven children. Until Monday morning that is. The German department was ill, had a high fever and we were told that he would be away for two days. This suited me as I was feeling a bit under-the-weather too so I took two mornings off. On Wednesday I arrived fit and well to find that the little German boy was still ill and added to that the Kindergarten were out at the playground in the village. I had lots of time for paper work and tidying up and preparing for the next few weeks. When the kindergarten got back from their adventures in the big wide world, we decided on the best way to use me for the rest of the week. No more mornings of paper-work or signing out and sitting with the newspaper over a slow breakfast in the local café! On Thursday I waited at the back door of the Kindergarten until someone was free to tell me who I was to work with first. Before I had time to speak to an adult a four-year-old boy, one of the usually loud and boisterous ones, had slipped his hand in to mine and asked: "Who is coming to you first?". His name had actually not been mentioned in our plans for the day but one glance at him and the staff all agreed that it would do him good to have a relaxing hour with paint, glue, scissors and what ever else we came up with. All the children in the Kindergarten know me. I make a point of popping my head round the door every day to say good morning when I arrive for my work. I think this is important as I often have to jump into the breach when a colleague is ill and it makes life easier when we all know each other. So, I knew this little boy with his hand in mine, he is not one of the original members of our Kindergarten when it opened four years ago, but it feels like he has been here for ever! We have been bumping into each other for a long time it seems. He is always busy playing with bricks, sticking and cutting, or rushing around on a tractor outside so we have smiled at each other a lot but have not had time for many words over the years. I soon discovered that he was a child with “ants-in-his-pants”, but, once settled, chatting to me and interested in our painting and collage we spent a happy relaxing hour together. Usually it is only the children with “special needs” who get one-to-one attention outside the Kindergarten rooms: the speech therapist for the children from different countries or with motor disorders, the advisor from the school for the visually impaired, the pre-school development advisor comes to those children who have been in their system from babyhood. Children like this lively little boy sometimes need to take an adult by the hand and quietly say "Today I want some time on my own. Today I have “special needs”. Fortunately we listened to him and fortunately I had the time. It was a great success all round ending with him asking me when he can come again as he has a specific arty project in mind. He will make a painting for the window, executed with special paints. We shall see, and I shall make time. I had another fifteen minute session with a three-year-old who had been looking for something to do all morning. Unable to stick to one game or one group of friends she came to paint with me. She is also a figety little thing who managed to stay in one place with her paint brush and made a man with blond hair to add to the art gallery on the door. The art gallery is always on the outside of the door and not inside the room, so that the children can show their friends and families their works of art without disturbing my groups. The day before I had watched two people on the stairs, a blind boy and the young man who is training to be a Heilerzieher. I have no idea what a Heilerzieher is in English, heilen means to heal and erzeihen means to bring up. I will let you decide for yourself want that makes him in English. These two were learning how to walk up the stairs without holding the banister, touching the wall and feeling the size of the steps and using leg-muscle power and not the arms to move upwards and downwards. I had given them some advise and the young man said it had worked immediately. I was happy when I was asked to take this little chap, born with no eyes, for an hour of individual attention. The last time that he came to me, or should have come to me, he cried so much that I took him back to the familiarity of the Kindergarten and played with him there. But now three months later I had a different child with me. He has become so self assured that he led the way to the stairs and then into the “Petö” room. He taught me so much. It is lovely to have a new task, something that makes me think hard about conductive upbringing and playing and living. This child did all of that, he got me thinking. He enjoyed all the games that we played, especially learning to play football without lifting his feet too high so as not to step on to the ball but high enough not to trip over. We made vegetable soup with our plastic vegetables, I was sorry that they did not smell it would have made identification a lot easier. Next time I will bring the real McCoy. We climbed the stairs too, using the same tricks I had taught them yesterday. With a short stick in the hand to use to feel around, and to hold in both hands and stretch forward to climb a stair we progressed well. When we were half way up we met the postman! The postman was brilliant, he wanted me to sign for a parcel but I explained that he would have to come upstairs to us as my little friend can not see and I could not leave him alone. Postie leapt up to us, introduced himself to my friend, shook him by the hand and held tight to it while I signed his odd, electronic machine with a plastic stick! What an interesting life we lead. Being self employed .... variety is the spice of life! Yes, self-employment is a bit risky, but these days being employed is no less risky. As a self-employed conductor I think I have more choices, more variety in my work than I would have in permanent employment. I am more adaptable and am ready to jump in to fill any role. Sometimes I work all hours under the sun, not necessarily a plus, but I can take time off to read the paper in the cafe when a client cancels! "How to ignite children's enthusiasm"